We process orders every business day, Monday through Friday. 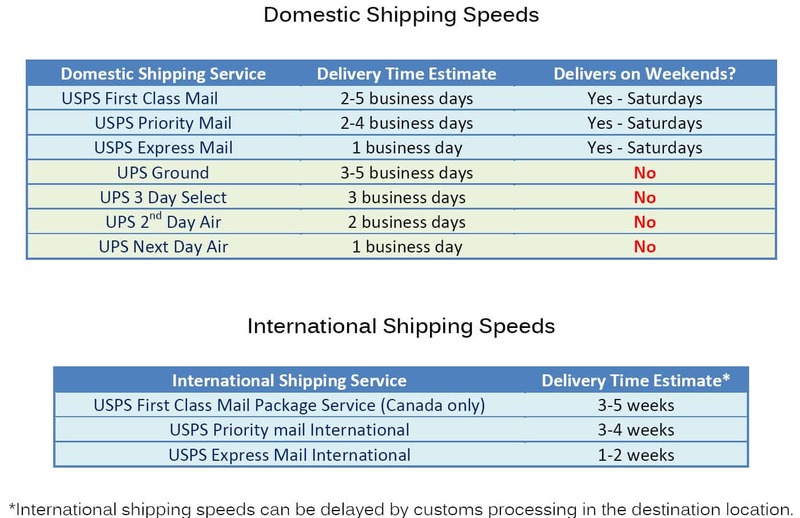 If you need the product by a certain date, please see the tables below, which contain information about selected shipping speeds, including estimated shipping times. Our site automatically generates shipping options based on availability in your area. Certain restrictions may prevent some of the below options from displaying. Please note: Carrier delays are rare, but can happen. We cannot guarantee the estimated delivery dates per the tables below, because any potential delays from the carrier are completely outside of our control. IMPORTANT: International destinations may charge VAT (value added tax) or other such duty fees for imports into the country. These fees are levied by the corresponding destination country, and can vary between countries. It is your responsibility to check with your local customs to find out what kind of duties or taxes may be required for imports, as we will not reimburse for any additional fees charged for “last mile delivery” of the item. We pay the full amount charged to us by USPS (United States Postal Service) which covers delivery of the package to the customs offices of the destination country only.